If you would like to sign up to write for Pipe Plaza, please visit this page for instructions on how to apply. 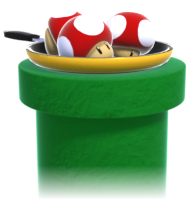 If you have any other questions about Pipe Plaza or The 'Shroom, you can ask me here, or message me on the forums. Thank you. 2 A New Era of Fun Stuff Starts Now! 10 A Summer of Fun! 14 Finish your homework, 'cause there's Fun Stuff to do! 37 Help, I've become director of Fun Stuff and I can't get up! Hey there, The Pyro Guy! This is Lord Bowser, giving you a heads-up that your section(s) are due by March 12th. Please PM me your completed section on the forums by then. If you need an extension, don't be afraid to ask for one, though please try to do so in good time. Please send me (MCD) your Fake News section(s) by May 17th. If you are unable to submit your section in time, please tell me as soon as possible, and I'll sort something out. This is Lord Bowser, giving you a heads-up that your section(s) are due by June 11th. Please PM me your completed section on the forums by then. If you need an extension, don't be afraid to ask for one, though please try to do so in good time. Please send me (MCD) your Fake News section(s) by June 15th. If you are unable to submit your section in time, please tell me as soon as possible, and I'll sort something out. Be aware that this edition of The 'Shroom is dedicated to Walkazo. Also, so sorry for how late this is. I've had a very busy week. This is Lord Bowser, giving you a heads-up that your section(s) are due by July 16. Please PM me your completed section on the forums by then. If you need an extension, don't be afraid to ask for one, though please try to do so in good time. Please send me (MCD) your Fake News section(s) by July 17th. If you are unable to submit your section in time, please tell me as soon as possible, and I'll sort something out. This is Lord Bowser, giving you a heads-up that your section(s) are due by August 13th. Please PM me your completed section on the forums by then. If you need an extension, don't be afraid to ask for one, though please try to do so in good time. Please send me (MCD) your Fake News section(s) by August 15th. If you are unable to submit your section in time, please tell me as soon as possible, and I'll sort something out. Finish your homework, 'cause there's Fun Stuff to do! This is Lord Bowser, giving you a heads-up that your section(s) are due by September 10th. Please PM me your completed section on the forums by then. If you need an extension, don't be afraid to ask for one, though please try to do so in good time. Sorry for this late notification - school is keeping me busy! If you need to be late, that's okay, but please do not send last minute. Please send me (MCD) your Fake News section(s) by 12th September. If you are unable to submit your section in time, please tell me as soon as possible, and I'll sort something out. This is Lord Bowser, giving you a heads-up that your section(s) are due by October 8th. Please PM me your completed section on the forums by then. If you need an extension, don't be afraid to ask for one, though please try to do so in good time. If you are running late, that's okay; I'm very busy as well. Just tell me ahead of time. I look forward to your section! Please send me (MCD) your Fake News section(s) by November 17th. If you are unable to submit your section in time, please tell me as soon as possible, and I'll sort something out. I am really sorry this is so late. If it's too late for you to submit then I can understand. This is Lord Bowser, giving you a heads-up that your section(s) are due by December 17th. Please PM me your completed section on the forums by then. If you need an extension, don't be afraid to ask for one, though please try to do so in good time. A quick reminder that this will be our holiday issue. We encourage you to make your submission holiday-related, although this is in no way a requirement. If you need to be late, please tell me. 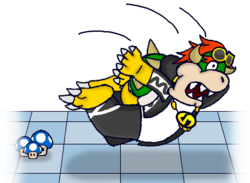 This is Lord Bowser, giving you a heads-up that your section(s) are due by January 14th. Please PM me your completed section on the forums by then. If you need an extension, don't be afraid to ask for one, though please try to do so in good time. Sorry for the late warning! As always, if you feel you need an extension, feel free to contact me so we can work something out. This is Lord Bowser, giving you a heads-up that your section(s) are due by February 11th. Please PM me your completed section on the forums by then. If you need an extension, don't be afraid to ask for one, though please try to do so in good time. Please send me (MCD) your Fake News section(s) by February 15th. If you are unable to submit your section in time, please tell me as soon as possible, and I'll sort something out. Please send me (MCD) your Fake News section(s) by March 16th. If you are unable to submit your section in time, please tell me as soon as possible, and I'll sort something out. Please send me (MCD) your Fake News section(s) by 18th May. If you are unable to submit your section in time, please tell me as soon as possible, and I'll sort something out. Please send me (MCD) your Fake News section(s) by June 16th. If you are unable to submit your section in time, please tell me as soon as possible, and I'll sort something out. Sorry it's so late, I've had a really busy week. Please send me (MCD) your Fake News section(s) by September 13th. If you are unable to submit your section in time, please tell me as soon as possible, and I'll sort something out. This page was last edited on November 20, 2018, at 22:02.